We have not long got back off our epic adventure holidaying in Port Cogolin and exploring Italy by following the route of the Millie Miglia, so we feel really spoiled being able to return to Port Cogolin so soon after. As a holiday diary this might be a tad dull after the excitement of the last one as this is definitely more of a beach and relaxation holiday. However, to pep it up a bit we have planned a day trip to Monaco on Wednesday where we hope to do a few slightly different things than the normal tourist with our day there. Anyway this is our holiday as it unfolds. The routine for our holidays is almost always the same – Peanut has the Friday off work to do all the last minute packing and give a final briefing to her Mum who house and cat sits while we are way, while I go to work and wait for Peanut to collect me at half past four. Work was busy but understandably still dragged a little for me as my excitement mounted. Finally, it was time to go and I was lucky and got away at quarter past so we were off to a good start! We had booked a Tunnel crossing at 8.20 which meant we had to get to the Tunnel at Dover at 7.50. This gave us 3 and a half hours to get there. On reflection this was perhaps a bit tight for Friday night travelling and getting around London and yes you guessed it we missed our Tunnel crossing! When we get back I am considering starting a Facebook campaign to have London moved to somewhere out of the way such as Lincolnshire! Seriously this is a great idea as 90% of the country cannot avoid London if they want to go to France via Dover. Paris by contrast is very easy to avoid! The traffic on the M25 was shocking and really held things up. Peanut was driving and it meant she had to do the whole drive as we did not have time even to swap. Her efforts were valiant and courageous and SilverBeast our MINI JCW Coupe did his best too by using dynamic navigation to detect the jams and try to route around them. We arrived at 10 past 8, missed our slot and were informed that the next free one was 20 past midnight! Finally we were rescued when a kind girl from behind the bar came up to us (by now we were almost the only ones left in the place) and said there are spaces on the next train if you are quick! 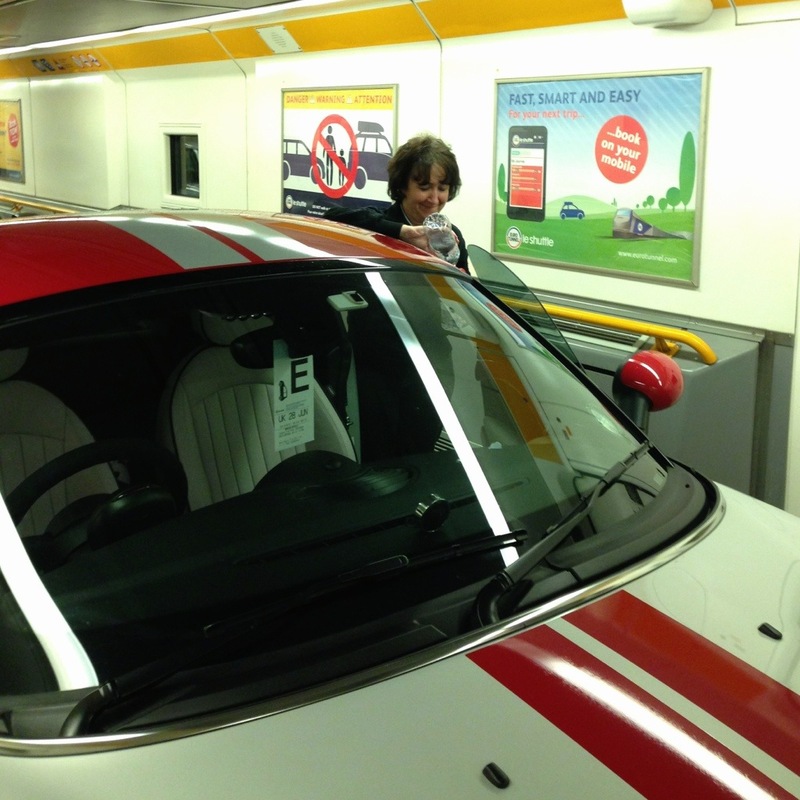 We were quick, we got the train and were driving on French soil at Midnight British time, one pm French time! We had lost some time, which was frustrating but on the plus side we rarely have hold ups in France and this proved to be the case. We share the driving, and in the dark hours one of us slept while the other drove. It was raining and the skies were full of cloud. As daylight began to challenge night we saw just how moody these clouds were and still it rained. We had set cruise control to the motorway speed limit, we use an electronic tag to fly through the tolls and despite the rain we were making good time. Sometimes we stop for a little sleep in the car but this time we didn’t feel the need and like Biggles we pressed on. We reached Lyon just before 7 and got through the city with no issues. We were on the home run, so we stopped for some breakfast and then got back on the drive. A speck of blue poked through the grey sky, the rain stopped. A ray of sun broke through the cloud like a sword and began to fence with the cloud. It tore the cloud to shreds and we basked in sunshine and blue skies and reached Port Cogolin and our apartment at twelve. The apartment was clean and tidy not just from our last visit but because some mates had been the week before so we were settled in and unpacked in about half an hour. One o’ clock saw me poolside and by three I had two swims and the beginnings of a tan under my belt. Five saw us walk over to Geant the nearby hypermarket to stock up for the week and eight saw us eating salmon from the BBQ with rice and ratatouille. Yep It’s official I’m on holiday. Categories: France, iPhone, Photo Blog, Port Cogolin Holiday Diary 2013, Travel | Tags: holiday, Port Cogolin | Permalink.